Lee & Low Books, 9781600603488, 32pp. Young Mason Steele takes pride in turning his father's excited ramblings about the latest civil rights incidents into handwritten business letters. One day Pa comes home with a gift from his civil rights group: a typewriter. Thrilled with the present, Mason spends all his spare time teaching himself to type. Soon he knows where every letter on the keyboard is located. When the civil rights group wins a school desegregation case, Mason learns that now he will be attending a formerly all-white high school. Despite his fears and injustice from the students and faculty, Mason perseveres. He does well in school--especially in his typing class. 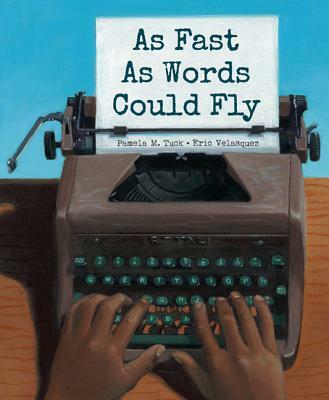 And when he competes in the county typing tournament, Mason decides to take a stand, using his skills to triumph over prejudice and break racial barriers.Winner of Lee & Low's New Voices Award, As Fast As Words Could Fly is an inspiring testament to the power of hard work, determination, and belief in yourself to overcome life's challenges.